Automation is becoming more and more prevalent in everyday life. People are turning their duties over to robots and machines, acting like it’s the newest thing. What if I told you there is a company that has been producing reliable robotic machinery for home use and owner effectiveness for over 15 years? That company is iRobot’s Roomba, based in Bedford, Massachusetts, USA. iRobot has been enjoying a near-monopoly in the robotic vacuum cleaner market for such an extended time that first-generation Roomba’s are now old enough to hit the pubs. But, there are now seven Roomba models. This being the case, it’s become near impossible to determine which Roomba is the best fit for your individual needs. 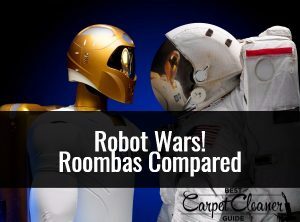 Before you drop some major coin on a robotic vacuum to salvage a few hours a month of your life spent vacuuming, give this guide a read to figure out which Roomba is best suited for your needs, and which offer the best “bang for your buck.” We put five of the best Roomba models currently on the market to take the guesswork out of your decision-making. While the Roomba is a solid product, information available on iRobot’s website leaves much to be desired. Product details are vague, and at times the information given can be misleading when comparing models against one another, skewing towards the higher-end robotic vacuum models. Want a rule-of-thumb for this potential pitfall? The higher the model number, the higher the price. A sidecar for this: the higher the model number, the more available features. But don’t get too wrapped up in incredible feature sets. You likely won’t need every single option on the highest priced Roomba model. You wouldn’t buy an expensive, fully-loaded luxury car because you want to get to and from Lidl, would you? Instead of attempting to write detailed reviews of all Roomba models available in the United Kingdom, we decided to make this Robot Wars a top-five death-match between the 650, 696, 880, 774, and 966 (basically the UK versions of the 650, 690, 860, 770, and 960). The reviews will discuss positives and negatives of each of the five models, as well as comparisons to alternatives, and in what situations each model works best. Without any further ado, let’s hop right into the Robot Wars cage and get down to business! There was a time a few short years back when the Roomba 650 was considered the flagship autonomous robotic vacuum. While no longer the case due to the rapid acceleration of robot-vacuum market demand, the Roomba 650 is still for sale in many brick and mortar establishments and online stores catering to customers in the United Kingdom. At one time, it was the best-selling robotic vacuum in history due to its impressive combination of features and price. That said, there remains a stellar number of features to enjoy on the Roomba 650. All Roomba models of autonomous vacuum use randomization patterns to navigate the confines of your house. This process has been proven to result in higher quality carpet and floor cleanings than the back and forth motion standard with normal push vacuums. The Roomba 650 is programmable and was one of the first self-docking robot vacuums made available. What this means for the consumer is that they can set the Roomba to perform its tasks while they are away from home, and return to a clean floor and well-docked Roomba. High-performing for both dirt and hair, the 650 can also reach under most furniture, cleaning areas before untouchable by upright vacuums with thick frames. There are pitfalls to the streamlined longevity of the Roomba 650. One such pain point that is touched upon by online reviewers is the 650’s traditional rotating brush mechanism. Rotating brushes have long been a staple of standard vacuums. Recently, many vacuums have opted instead for increasing suction power, to stop items such as carpet fibers and hair from getting stuck in bristles and clogging the entry point for debris. The 650 retains the old-school rotating brushes. This becomes troublesome when hair gets lodged in the bristles and wrapped around. With my own experiences with the 650 and a wife with longer hair, every third vacuum session I would have to remove the rotating brush spindle and cut out all the hair. Going more than three courses without performing this task would destroy the suction power of the 650 until the hair-cutting process was finally performed. Granted, the 650 is easier to remove hair from than most upright or stick vacuums, as the brushes are removable and the product comes with a hair extractor. Still, I would pay more to reduce this need, as would most. The Roomba 650 finished fifth of five. 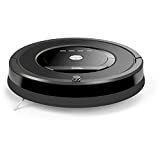 This model should be a top choice if the price is your only driving factor, as it is the most affordable Roomba model still in production and available on Amazon.co.uk. It is helpful to pick a higher-level autonomous robot vacuum model instead. The bonus of brushless rollers is worth their weight in gold on higher-priced Roomba models. The hair accumulation in the 650’s rolling brushes causes frequent maintenance non-advantageous for those purchasing a Roomba to spend less time with their vacuum in the first place. The added issue of the older “virtual wall” stoppage accessory requiring battery power that needs consistent replacement is another pain point that should glide users away from the 650 and towards newer, higher-quality Roomba models. The Roomba 696 (690 in the USA) represents a step towards technological advancement for iRobot. 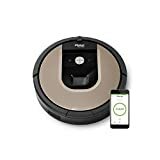 It was introduced recently as an effective entry-level replacement for the above-reviewed Roomba 650, and to compete with other less expensive entry-level autonomous robot vacuum brand alternatives. After the success of the Roomba 650, competing brand Neato Robotics released a version of their entry-level robotic vacuum that offered WiFi and application connectivity. This was a feature that had been reserved for Roomba’s pricier, more feature-rich models at the time. To combat this and regain their entry-level autonomous vacuum market share, Roomba countered with the 696 model. While the three upgrades above are strong when compared to the 650, Roomba failed to develop an upgraded workaround for the most prevalent user complaint. The rotating brush remains a staple piece of functionality in the Roomba 696. While other higher-level models of Roomba and Neato products forwent the rotating brush in favor of brushless rubber rollers, the 696 failed to adopt this upgraded feature, leading to the same hair-untangling issues from the 650 model. The Roomba 696 finished fourth of five in our list. Don’t let the new features of the Roomba 696 entice you to spend the extra money to buy this robotic vacuum over the Roomba 650. Besides a better battery life and phone application integration, you are looking at the Roomba 650 with a few extra bells and whistles, and the same problematic insides seen in the prior model. Yes, the ability to kick-start your Roomba while away is a great addition, but is also not something that will be needed on a regular basis. Robotic vacuums were developed to be a set-it-and-forget-it, autonomous solution to vacuuming. If you need to perform a task before and after every vacuuming session, you are not utilizing the robotic vacuum to its fullest potential. The hair accumulation in the 696’s rolling brushes cause consistent maintenance, which is non-advantageous for those buying their Roomba to spend less time on their vacuum maintenance. The issue of the older “virtual wall” stoppage accessory requiring battery power is another pain point that should glide users away from the 696 (and 650) and towards newer, higher-quality models. The 650 and 696 have been analyzed. They are the entry level options from iRobot in the autonomous robotic vacuum market space. With the Roomba 880, we take things a few steps further, diving headfirst into the mid-range robo-vacuum realm. The Roomba 880’s price tag is not too far a stretch from the 696, which makes it the ideal choice for those who are looking for entry-level, but are not afraid to spend a little more for far less hassle in the long run. Let’s delve further. In the complex world of vacuums, brushless rollers are a kingpin compared to traditional rolling brushes found in most devices. Even some of the high-range Dyson hand-maneuvered upright vacuums keep rolling brushes, which can be a major pain point for users. Purchasing and using the Roomba 880, with its new-to-iRobot brushless rollers will give you pause to ever step back into the darkness that is rolling brushes. iRobot refers to these brushes as “tangle-free debris extraction tools”. In layman’s terms, they are two rubberized rollers with protruding flaps that slap and vibrate the floor as the Roomba 880 maneuvers itself around the confines of your home. With these brushless rollers, hair rarely ever gets stuck in the flaps. The Roomba 880 also includes the same Virtual Wall that is present in the Roomba 650 and Roomba 696 models. This accessory acts as a signal of sorts for the vacuum that a certain area of the home is blocked off from its randomized path. When switched on, the Virtual Wall emits a bean that blocks off openings up to eight feet in width. The enhanced Virtual Wall available with only the Roomba 880 model and above can be switched into Halo mode. This new mode marks off a circle around the beacon in comparison to the beam. This communicates to the Roomba to give a berth around the constraints of the halo, ideal for things such as pet water bowls, delicate lamps, or furniture. The Roomba 880 finished third of five in our list, right in the center of the pack. This vacuum is a solid step in the right direction for a mid-range autonomous robotic vacuums. The brushless rollers are a wonderful improvement over the 650 and 696 models, and the technological advancements of the Virtual Wall is an incredible addition. We do wish that for the increased price, there was either a second Virtual Wall included, or stronger new features other than the brushless rollers. All in all, if you are aware that entry-level comes with its struggles, and you have a simple home layout, the Roomba 880 is the ideal option to meet your autonomous robotic vacuum needs. The Roomba 774 (770) kicks things into a higher gear, and grabs the number two spot of five in our list of Roomba options. While the 774 is an older model than both the 880 and 696, its cost to benefit ratio exceeds both these two models and the Roomba 650. The 774 comes with a three-stage cleaning system found in other Roomba models, allowing for dirt extraction from carpet, linoleum, hardwood floor, tiling and more. The 700 series of Roomba vacuums build upon the 600 levels with a more robust cleaning system, improved aero-vac bin with larger and more efficient HEPA filter, and improved battery life. Counter-rotating brush heads perform like a broom and dust pan, lifting and sweeping at the same time. The Roomba 774 also comes with a self-adjusting cleaning head suspension, unseen in lower-numbered Roomba models. This addition allows the vacuum to travel from carpet to hard flooring without a hitch in the sucking power of the machine. While the 774 does not have the rubberized brushless rollers that the 880 touts, it does have a bin, which pulls hair from the brushes and prevents overrun of wrapped hair in the bristles. The aero-vac technology and filtration system in the Roomba 774 was designed to remove pet hair and dander from carpets and floors. The dual HEPA filters do an incredible job preventing this dust and dirt from re-circulating out of the vacuum back into the room, leaving the home cleaner and the air purer in comparison to the lower priced 650 and 696, and higher priced 880 Roomba models. The Roomba 774 is the first runner up on our list. This vacuum, while not as feature rich and user friendly as the previously-reviewed 880 model, is a strong step ahead of the older 650 and newer 696 models, without a drastic increase in price to correspond with the advancements. The 774’s dual HEPA filtration is an incredible bonus in a niche marred by dusty exhaust from subpar engineering packed into small robotic spaces. The bin pulls hair from the brushes, which is a good compromise between brush rollers and brushless rollers. We found that the need to cut hair from bristles decreased from once every three vacuum sessions with the 650 and 696, to once every ten sessions with the 774. One touch cleaning - Just turn on, push a button, and watch it go! Here is the king. The Roomba 966 (960) is the Bentley of autonomous robotic vacuums. Even with its heftier price tag (starting at [PRICE]), the 966 model from iRobot is the winner of this reincarnation of Robot Wars. Released in summer 2016, the 966 combines the Wifi capabilities of the 890 model with the brushless heads of the 880, the filtration power of the 774, and then takes things to a new level with an advanced feature set that was before unheard of in robotic vacuums. The Wifi connectivity via Roomba app allows users the option to start and track their vacuum from anywhere they have Internet access. This rebooted app records the total square footage vacuumed, the count of total cleanings, and the time spent vacuuming, acting as a literal fitness tracker for your vacuum. Statistics junkies rejoice! Extra app features include remote cleaning scheduling, preferences and settings, dust bin emptying reminders, and maintenance notifications. The Roomba 966 was also the first autonomous robotic vacuum to come equipped out of the box with visual sensing technology. These sensors use furniture and walls as landmarks to develop a map of your home. While previous models lean on randomized patterns to vacuum floors (which can result in occasional haphazard cleaning and spots missed), the visual mapping of the Roomba 966 can vacuum in straight lines. This feature serves to render missed spots an almost impossibility. The 966 also comes with enhanced auto-recharging mid-session. What this means is that when the Roomba 966 is low on battery, it will return to the docking station, recharge, and resume vacuuming in the exact place it left off. This makes the Roomba 966 the ideal option for larger and more complex home layouts. As with the visual sensing, the 966 is the first autonomous robotic vacuum to offer this technology. The Roomba 966 is a titan, and comes with a price tag to match. Even with the inflated cost, the 966 provides the best bang for your buck when it comes to your autonomous robotic vacuum selection. While the 966 may not be the ideal option for those on a budget or with smaller homes, the benefits outweigh the cost for those with medium-to large homes and budgets and lacking the free time to vacuum themselves. Retaining the positive aspects of all four reviewed models, the Roomba 966 is as close as this market can currently get to the “full package”. It is for these reasons that the Roomba 966 is the winner of this reincarnation of Robot Wars.